New York City's Financial District in Lower Manhattan, including Wall Street. New York is ranked as one of the largest International Financial Centres ("IFC") in the world. The City of London (the "Square Mile") is one of the oldest financial centres. London is ranked as one of the largest International Financial Centres ("IFC") in the world. Financial centres are locations with a concentration of participants in banking, asset management, insurance or financial markets with venues and supporting services for these activities to take place. Participants can include financial intermediaries (such as banks and brokers), institutional investors (such as investment managers, pension funds, insurers, hedge funds), and issuers (such as companies and governments). Trading activity can take place on venues such as exchanges and involve clearing houses, although many transactions take place over-the-counter (OTC), that is directly between participants. Financial centres usually host companies that offer a wide range of financial services, for example relating to mergers and acquisitions, public offerings, or corporate actions; or which participate in other areas of finance, such as private equity and reinsurance. Ancillary financial services include rating agencies, as well as provision of related professional services, particularly legal advisory and management accounting. Offshore Financial Centre ("OFC"). The IMF noted that OFCs are usually smaller, and provide more specialist services, however, OFCs still ranged from centres that provide specialist and skilled activities, attractive to major financial institutions, and more lightly regulated centres that provide services that are almost entirely tax driven, and have very limited resources to support financial intermediation. The IMF listed 46 OFCs in 2000, the largest of which was Ireland, the Caribbean (includes the Cayman Islands, and the British Virgin Islands), Hong Kong, Singapore and Luxembourg. The IMF noted that the three categories were not mutually exclusive and that various locations could fall under the definition of an OFC and an RFC, in particular (e.g. Singapore and Hong Kong were cited). The IMF noted that OFCs could be set up for legitimate purposes (listing various reasons), but also for what the IMF called dubious purposes, citing tax evasion and money–laundering. In 2007, the IMF produced the following definition of an OFC: a country or jurisdiction that provides financial services to nonresidents on a scale that is incommensurate with the size and the financing of its domestic economy. The FSF annual reports on global shadow banking use the IMF definition to track the OFCs with the largest financial centres relative to their domestic economies. Progress from 2000 onwards from IMF–OECD–FATF initiatives on common standards, regulatory compliance, and banking transparency, has reduced the regulatory attraction of OFCs over IFCs and RFCs. Since 2010, academics considered the services of OFCs to be synonymous with tax havens, and use the term OFC and tax haven interchangeably (e.g. the academic lists of tax havens include all the FSF–IMF OFCs). 24 Sink OFCs: jurisdictions in which a disproportionate amount of value disappears from the economic system (e.g. the traditional tax havens). Sink OFCs rely on Conduit OFCs to re–route funds from high–tax locations using base erosion and profit shifting ("BEPS") tax planning tools, which are encoded, and accepted, in the Conduit OFC's extensive networks of global bilateral tax treaties. Because Sink OFCs are more closely associated with traditional tax havens, they tend to have more limited treaty networks and access to global higher–tax locations. Prior to the 1960s, there is little data available to rank financial centres. :1 In recent years many rankings have been developed and published. Two of the most relevant are the Global Financial Centres Index and the Xinhua–Dow Jones International Financial Centres Development Index. The Central District of Hong Kong, one of the main financial centres in Asia, seen from the Peak. (Δ) Appears on the FSF–IMF Offshore Financial Centre (OFC) Lists. (‡) Also appears as one of the top 5 Sink OFC, in CORPNET's 2017 research. Frankfurt's banking district, home to various global and European bank headquarters. The district houses the main German stock exchange and many EU and German regulators. The Xinhua–Dow Jones International Financial Centers Development Index was compiled annually by the Xinhua News Agency of China with the Chicago Mercantile Exchange and Dow Jones & Company of the United States from 2010 to 2014. During that time New York was the top–ranked centre. Old finance centers such as Amsterdam, London, Paris, New York, and Tokyo have long histories. Today there is a diverse range of financial centres worldwide. While New York and London often stand out as the leading global financial centres, other established financial centres provide significant competition and several newer financial centres are developing. Despite this proliferation of financial centres, academics have discussed evidence showing increasing concentration of financial activity in the largest national and international financial centres in the 21st century. :24–34 Others have discussed the ongoing dominance of New York and London, and the role linkages between these two financial centres played in the financial crisis of 2007–08. Comparisons of financial centres focus on their history, role and significance in serving national, regional and international financial activity. Each centre's offering includes differing legal, tax and regulatory environments. One journalist suggested three factors for success as a financial city: "a pool of capital to lend or invest; a decent legal and taxation framework; and high-quality human resources". New York, London and Tokyo are in every list of major IFCs. Some of the major RFCs (see below), such as Paris, Frankfurt, Chicago, and Shanghai appear as IFCs in some lists. The New York Stock Exchange on Wall Street, the world's largest stock exchange by listed capitalisation. New York. Since the middle of the 20th century, New York City, represented by Wall Street, has been described as a leading financial centre. :1:25:4–5 Over the past few decades, with the rise of a multipolar world with new regional powers and global capitalism, numerous financial centres have challenged Wall Street, particularly London and several in Asia, which some analysts believe will be the focus of new worldwide growth. :39–49 One source described New York as extending its lead as the world's centre of finance in September 2018; according to Reuters, the think-tank New Financial concluded the “raw” value of domestic and international financial activity like managing assets and issuing equity underscored the position of New York as the world's leading financial centre. New York City remains the largest centre for trading in public equity and debt capital markets, driven in part by the size and financial development of the U.S. economy. :31–32 The NYSE and NASDAQ are the two largest stock exchanges in the world. New York also leads in hedge fund management; private equity; and the monetary volume of mergers and acquisitions. Several investment banks and investment managers headquartered in New York City are important participants in other financial centres. :34–35 The New York Federal Reserve Bank, the largest within the Federal Reserve System, regulates financial institutions and implements U.S. monetary policy, which in turn influences the world's economy. The three major global credit rating agencies – Standard and Poor's, Moody's Investor Service, and Fitch Ratings – are headquartered or co–headquartered in New York City, with Fitch being co–headquartered in London. The London Stock Exchange in the City of London, the largest exchange in Europe by capitalisation. London continues to maintain a leading position as a financial centre in the 21st century, and maintains the largest trade surplus in financial services around the world. However, like New York, it faces new competitors including fast-rising eastern financial centres such as Hong Kong and Shanghai. London is the largest centre for derivatives markets, foreign exchange markets, money markets, issuance of international debt securities, international insurance, trading in gold, silver and base metals through the London bullion market and London Metal Exchange, and international bank lending. :2 London benefits from its position between the Asia and U.S. time zones, and has benefited from its location within the European Union,:1 though this may end following the outcome of the Brexit referendum of 2016 and the decision of the United Kingdom to leave the European Union. As well as the London Stock Exchange, the Bank of England, the second oldest central bank, and the European Banking Authority are in London, although the EBA is moving to Paris in March 2019 after Brexit. 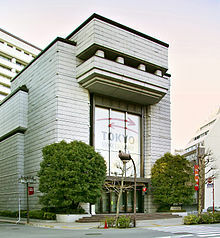 The Tokyo Stock Exchange, the largest stock exchange in Asia. Tokyo. One report suggests that Japanese authorities are working on plans to transform Tokyo but have met with mixed success, noting that "initial drafts suggest that Japan's economic specialists are having trouble figuring out the secret of the Western financial centres' success." Efforts include more English-speaking restaurants and services and the building of many new office buildings in Tokyo, but more powerful stimuli such as lower taxes have been neglected and a relative aversion to finance remains prevalent in Japan. Tokyo emerged as a major financial centre in the 1980s as the Japanese economy became one of the largest in the world. :1 As a financial centre, Tokyo has good links with New York City and London. These centres appear in all FSF–IMF lists of OFCs and, bar the Caribbean OFCs of the Cayman Islands, the British Virgin Islands, and Bermuda, represent all the major OFCs. Some also appear as RFCs in various lists, particularly Hong Kong, and Singapore. They also appear on most lists of major tax havens, and on lists of the largest Conduit and Sink OFCs in the world. Amsterdam. Amsterdam is well known for the size of its pension fund market. It is also a centre for banking and trading activities. Amsterdam was a prominent financial centre in Europe in the 17th and 18th centuries and several of the innovations developed there were transported to London. 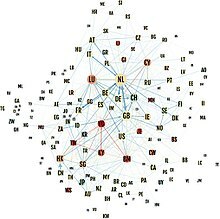 :24 In June 2017, a study published in Nature ranked the Netherlands as the world's largest Conduit OFC, a term use to describe the re-routing of fund flows to tax havens. Dublin. Dublin (via its International Financial Services Centre, "IFSC"), is a specialised financial services centre with a focus on fund administration and fund domiciling, as well as base erosion and profit shifting ("BEPS") tax tools. It is the largest securitisation location in the EU–28, and the second largest domicile for investment funds, particularly alternative investment funds, after Luxembourg. Many of the funds domiciled in Dublin are managed in London. :5–6 Dublin's advanced BEPS tax tools, for example the double Irish, the single malt, and the capital allowances for intangible assets ("CAIA") tools, have made Ireland the world's largest corporate tax haven. The International Finance Centre in Hong Kong, opened in 2003. Hong Kong. As a financial centre, Hong Kong has strong links with London and New York City. :10–11 It developed its financial services industry while a British territory and its present legal system, defined in Hong Kong Basic Law, is based on English law. 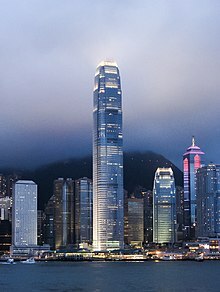 In 1997, Hong Kong became a Special Administrative Region of the People's Republic of China, retaining its laws and a high degree of autonomy for at least 50 years after the transfer. Most of the world's 100 largest banks have a presence in the city. Hong Kong is a leading location for initial public offerings, competing with New York City, and also for merger and acquisition activity. Luxembourg. Luxembourg is a specialised financial services centre that is the largest location for investment fund domiciliation in Europe, and second in the world after the United States. Many of the funds domiciled in Luxembourg are managed in London. :5–6 Luxembourg is the leading private banking centre in the Eurozone and the largest captive reinsurance centre in Europe. 143 banks from 28 different countries are established in Luxembourg. The country is also the third largest renminbi centre in the world by numbers, in certain activities such as deposits, loans, bond listing and investment funds. Three of the largest Chinese banks have their European hub in Luxembourg (ICBC, Bank of China, China Construction Bank). Singapore. With its strong links with London, Singapore has developed into the Asia region's largest centre for foreign exchange and commodity trading, as well as a growing wealth management hub. Other than Tokyo, it is one of the main centres for fixed income trading in Asia. However, the market capitalisation of its stock exchange has been falling since 2014 and several major companies plan to delist. Zurich. Zurich is a significant centre for banking, asset management including provision of alternative investment products, and insurance. Since Switzerland is not a member of the European Union, Zurich is not directly subject to EU regulation. In some lists, RFCs such as Paris, Frankfurt, Chicago, and Shanghai appear as IFCs, however, they do not appear in all lists. They are certainly major RFCs. Chicago. The Illinois city has the "world’s largest [exchange-traded] derivatives market" since the Chicago Mercantile Exchange and the Chicago Board of Trade merged in 2007, under the CME Group. Dubai. The second largest emirate in the United Arab Emirates is a growing centre for finance in the Middle East, including for Islamic finance. Its emergence as a financial centre is relatively recent, although commercial banking activity in the UAE became established in the second half of the 20th century (the first commercial bank in Dubai was British Bank of the Middle East in 1946, and the first domestic commercial bank was the National Bank of Dubai established in 1963). The Frankfurt Stock Exchange building, which dates back to 1879. Frankfurt. Frankfurt attracts many foreign banks which maintain offices in the city. It is the seat of Deutsche Börse, one of the leading stock exchanges and derivatives markets operators, and the European Central Bank, which sets the monetary policy for the single European currency, the euro; in addition, in 2014 the European Central Bank took over responsibility for banking supervision for the 18 countries which form the Eurozone. It is also the seat of Deutsche Bundesbank, the German central bank, as well as of EIOPA, the EU's supervisory authority for insurances and occupational pension systems. 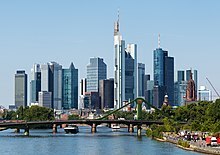 Frankfurt has been the financial centre of Germany since the second half of the 20th century as it was before the mid-19th century. Berlin held the position during the intervening period, focusing on lending to European countries while London focused on lending to the Americas and Asia. Paris. Alongside equity trading on the Paris Stock Exchange, there is futures and options trading, insurance, corporate banking and asset management taking place in Paris. The city is home to the Banque de France and the European Securities and Markets Authority. Paris has been a major financial centre since the 19th century. :1 The European Banking Authority is also moving to Paris in March 2019 following Brexit. Seoul. South Korea's capital has developed significantly as a financial centre since the late-2000s recession. In 2009, Seoul ranked 53rd among global financial centres; by 2012, Seoul had risen to number 9. Seoul has continued to build office space with the completion of the International Financial Center Seoul in 2013. It ranked 7th in the 2015 Global Financial Centres Index, recording the highest growth in rating among the top ten cities. Shanghai. Official efforts have been directed to making Pudong a financial leader by 2010. Efforts during the 1990s were mixed, but in the early 21st century, Shanghai gained ground. Factors such as a "protective banking sector" and a "highly restricted capital market" have held the city back, according to one analysis in 2009 in China Daily. Shanghai has done well in terms of market capitalisation but it needs to "attract an army of money managers, lawyers, accountants, actuaries, brokers and other professionals, Chinese and foreign" to enable it to compete with New York and London. China is generating tremendous new capital, which makes it easier to stage initial public offerings of state-owned companies in places like Shanghai. Sydney. Australia's most populous city is a financial and business services hub not only for Australia but for the Asia-Pacific region. Sydney competes quite closely with other Asia Pacific hubs, however it concentrates a greater portion of Australian-based business in terms of clients and services. Sydney is home to two of Australia's four largest banks, the Commonwealth Bank of Australia and Westpac Banking Corporation, both headquartered in the Sydney CBD. Sydney is also home to 12 of the top 15 asset managers in Australia, Melbourne, on the other hand, tends to concentrate more of the Australian superannuation funds (pension funds). Sydney is using the large Barangaroo development project on its harbour to further position itself as an Asian Pacific hub. Sydney is also home to the Australian Securities Exchange and an array of brokerage banks which are either headquartered or regionally based in Sydney including Australia's largest investment bank Macquarie Group. Toronto. The city is a leading market for Canada's largest financial institutions and large insurance companies. It has also become one of the fastest growing financial centres following the late-2000s recession, helped by the stability of the Canadian banking system. Most of the financial industry is concentrated along Bay Street, where the Toronto Stock Exchange is also located. Others. Mumbai is an emerging financial centre, which also provides international support services to London and other financial centres. Cities such as São Paulo, Mexico City and Johannesburg and other "would-be hubs" lack liquidity and the "skills base," according to one source. Financial industries in countries and regions such as the Indian subcontinent and Malaysia require not only well-trained people but the "whole institutional infrastructure of laws, regulations, contracts, trust and disclosure" which takes time to happen. Primitive financial centres started in the 11th century in the Kingdom of England at the annual fair of St. Giles and in the Kingdom of Germany at the Frankfurt autumn fair, then developed in medieval France during the Champaign Fairs. The first real international financial center was the City State of Venice which slowly emerged from the 9th century to its peak in the 14th century. Tradable bonds as a commonly used type of security, were invented by the Italian city-states (such as Venice and Genoa) of the late medieval and early Renaissance periods. For the origin and history of the bourse in general (not to be confused with the concept of the stock exchange and stock market), see exchange (organized market). In the sixteenth century, the overall economic supremacy of the Italian city-states gradually came to an end, and the centre of financial activities in Europe shifted to the Low Countries, first to Bruges, and later to Antwerp and Amsterdam. They also became important centres of financial innovation. 17th-century etching of the Oost-Indisch Huis (Dutch for "East India House"), the headquarters of the United East India Company (VOC) in Amsterdam. Considered by many to be the first historical model of the multinational corporation in its modern sense, the VOC was also the first company to be listed on a formal stock exchange. In other words, the VOC was the world's first publicly listed company (or publicly traded company). Courtyard of the Amsterdam Stock Exchange (Beurs van Hendrick de Keyser in Dutch), the world's first formal stock exchange. The Amsterdam Stock Exchange was the leading centre of global securities markets in the 17th century. The Dam Square in Amsterdam, by Gerrit Adriaensz Berckheyde, c. 1660. In the picture of the centre of highly cosmopolitan and tolerant Amsterdam, Muslim/Oriental figures (possibly Ottoman or Moroccan merchants) are shown negotiating. The 17th-century Dutch institutional innovations helped lay the foundations for modern-day international financial centres that now dominate the global financial system. In the 17th century, Amsterdam became the leading commercial and financial centre. It held this position for more than a century, and was the first modern model of an international financial centre. As Richard Sylla (2015) noted, "In modern history, several nations had what some of us call financial revolutions. These can be thought of as creating in a short period of time all the key components of a modern financial system. The first was the Dutch Republic four centuries ago." Amsterdam – unlike its predecessors such as Bruges, Antwerp, Genoa, and Venice – controlled crucial resources and markets directly, sending its fleets to all quarters of the world. The foundation of the Dutch East India Company (VOC), the world's first publicly listed company and an early pioneering model of the multinational corporation, in 1602. The birth of the VOC is often considered to be the official beginning of corporate-led globalization with the rise of modern corporations (multinational corporations in particular) as a highly significant socio-politico-economic force that affect human lives in every corner of the world today. As the first company to be listed on an official stock exchange, the VOC was the first company to issue stock and bonds to the general public. With its pioneering features, the VOC is generally considered a major institutional breakthrough and the model for modern corporations (large-scale business enterprises in particular). It was the first precursor to modern multinational corporations. The establishment of the Amsterdam Stock Exchange (or Beurs van Hendrick de Keyser in Dutch), the world's first official stock exchange,[f] along with the birth of the first fully functioning capital market in the early 1600s. While the Italian city-states produced the first transferable government bonds, they didn't develop the other ingredient necessary to produce the fully fledged capital market in its modern sense: a formal stock market. The Dutch were the firsts to use a fully fledged capital market (including the bond market and stock market) to finance public companies (such as the VOC and WIC). This was a precedent for the global securities market in its modern form. In the early 1600s the VOC established an exchange in Amsterdam where VOC stock and bonds could be traded in a secondary market. The establishment of the Amsterdam Stock Exchange (Beurs van Hendrick de Keyser) by the VOC, has long been recognized as the origin of modern-day stock exchanges that specialize in creating and sustaining secondary markets in the securities issued by corporations. The process of buying and selling shares (of stock) in the VOC became the basis of the first formal stock market. The Dutch pioneered stock futures, stock options, short selling, bear raids, debt-equity swaps, and other speculative instruments. Amsterdam businessman Joseph de la Vega's Confusion of Confusions (1688) was the earliest book about stock trading. Early techniques of stock-market manipulation occurred. The establishment of the Bank of Amsterdam (Amsterdamsche Wisselbank), often considered to be the first historical model of the central bank, in 1609. The birth of the Amsterdamsche Wisselbank led to the introduction of the concept of bank money. Along with a number of subsidiary local banks, it performed many functions of a central banking system. It occupied a central position in the financial world of its day, providing an effective, efficient and trusted system for national and international payments, and introduced the first ever international reserve currency, the bank guilder. Lucien Gillard calls it the European guilder (le florin européen), and Adam Smith devotes many pages to explaining how the bank guilder works (Smith 1776: 446-455). The model of the Wisselbank as a state bank was adapted throughout Europe, including the Bank of Sweden (1668) and the Bank of England (1694). In many respects, the 17th-century Dutch financial innovations helped shape the foundations of modern-day financial system of the world, and greatly influenced the financial history of many English-speaking countries (especially the United Kingdom and United States) in subsequent centuries. By the early 1800s, London officially replaced Amsterdam as the world's leading financial centre. In his book Capitals of Capital (2010), Youssef Cassis argues that the decline and fall of Amsterdam, as the world's foremost financial capital, was one of the dramatic events in history of global finance. London and Paris were the world's only prominent financial centers throughout most of the 19th century. :1 After 1870, Berlin and New York grew to become major financial centres mainly serving their national economies. An array of smaller international financial centers found market niches, such as Amsterdam, Brussels, Zurich, and Geneva. London remained the leading international financial center in the four decades leading up to World War I.:74–75:12–15 Since then, New York and London have developed leading positions in different activities and some non-Western financial centres have grown in prominence, notably Tokyo, Hong Kong and Singapore. Since the middle of the 20th century, New York City, represented by Wall Street, has been described as a leading financial centre. :1:25:4–5 Over the past few decades, with the rise of a multipolar world with new regional powers and global capitalism, numerous financial centres have challenged Wall Street, particularly London and several in Asia, which some analysts believe will be the focus of new worldwide growth. :39–49 One source described New York as extending its lead as the world's centre of finance in September 2018; according to Reuters, the think-tank New Financial concluded the “raw” value of domestic and international financial activity like managing assets and issuing equity underscored the position of New York as the world's leading financial centre. In Asia, Tokyo emerged as a major financial centre in the 1980s as the Japanese economy became one of the largest in the world. :1 Hong Kong and Singapore developed soon after leveraging their links with London and Britain. :10–11 In the 21st century, other centres have grown including Toronto, Sydney, Seoul and Shanghai. Dubai has become a centre for finance in the Middle East, including for Islamic finance. The rapid rise of India has enabled Mumbai to become an emerging financial centre. India is also making an International Financial Center GIFT City from scratch. GIFT city is now functional and has already won the crown of fastest emerging International Finance Center of South Asia. Linked to the rise of these new IFCs, has seen the rise of "partner OFCs" (offshore tax-havens to which funds are routed), such as Taiwan (a major Sink OFC for Asia, and 7th largest global Sink OFC), Mauritius (a major Sink OFC for S.E Asia, especially India, and Africa, and the 9th largest global Sink OFC). The private nationwide financial system in China was first developed by the Shanxi merchants, with the creation of so-called "draft banks". The first draft bank Rishengchang was created in 1823 in Pingyao. Some large draft banks had branches in Russia, Mongolia and Japan to facilitate the international trade. Throughout the nineteenth century, the central Shanxi region became the de facto financial centres of Qing China. With the fall of Qing Dynasty, the financial centers gradually shifted to Shanghai, mainly due to its geographical location at the estuary of the Yangtze river, and the control of customs in China. After the establishment of People's Republic of China, the financial centres in China today are Beijing, Shanghai and Shenzhen. ^ The IMF definition, and examples, from June 2000. ^ "Offshore" does not refer to the location of the OFC (i.e. many FSF–IMF OFCs, such as Luxembourg and Hong Kong, are located "onshore"), but to the fact that the largest users of the OFC are nonresident (i.e. the users are located "offshore"). ^ Tax–neutral is a term that OFCs use to describe legal structures where the OFC does not levy any taxes, duties or VAT on fund flows into, during, or exiting (e.g. no withholding taxes) the vehicle. Major examples being the Irish Qualifying investor alternative investment fund (QIAIF), and the Cayman Islands SPC. ^ This is since circa 2010, after the post 2000 IMF–OECD–FATF initiatives on common standards, regulatory compliance, and banking transparency, which had significantly weakened the regulatory attraction of OFCs over IFCs and RFCs. ^ The concept of the bourse (or the exchange) was 'invented' in the medieval Low Countries, most notably in predominantly Dutch-speaking cities like Bruges and Antwerp, before the birth of formal stock exchanges in the 17th century. From Flemish cities the term 'beurs' spread to other European states where it was corrupted into 'bourse', 'borsa', 'bolsa', 'börse', etc. In Britain, too, the term 'bourse' was used between 1550 and 1775, eventually giving way to the term 'royal exchange'. Until the early 1600s, a bourse was not exactly a stock exchange in its modern sense. With the founding of the Dutch East India Company (VOC) in 1602 and the rise of Dutch capital markets in the early 17th century, the 'old' bourse (a place to trade commodities, government and municipal bonds) found a new purpose – a formal exchange that specialize in creating and sustaining secondary markets in the securities (such as bonds and shares of stock) issued by corporations – or a stock exchange as we know it today. ^ a b c "Offshore Financial Centers: IMF Background Paper". International Monetary Fund. 23 June 2000. ^ "Financial Centres: What, Where and Why?" (PDF). The University of Western Ontario. Retrieved 24 May 2015. ^ a b c d e f Roberts, Richard (2008). The City: A Guide to London's Global Financial Centre. Economist. ^ "Report from the Working Group on Offshore Centres" (PDF). Financial Stability Forum. 5 April 2000. ^ a b Javier Garcia-Bernardo; Jan Fichtner; Frank W. Takes; Eelke M. Heemskerk (24 July 2017). "Uncovering Offshore Financial Centers: Conduits and Sinks in the Global Corporate Ownership Network". Scientific Reports, Nature Publishing Group. 7 (6246). ^ a b c d e f g h i j Cassis, Youssef (2006). Capitals of Capital: A History of International Financial Centres, 1780–2005. Cambridge, UK: Cambridge University Press. ISBN 978-0-511-33522-8. ^ "The Global Financial Centres Index 21". Z/Yen Group. March 2017. Archived from the original on 13 September 2015. Retrieved 12 August 2017. ^ "The Global Financial Centres Index 25" (PDF). Long Finance. March 2019. ^ "Xinhua–Dow Jones International Financial Centers Development Index (2014)" (PDF). Xinhua and Dow Jones. November 2014. p. 6. ^ a b c d Cameron, Rondo; Bovykin, V.I., eds. (1991). International Banking: 1870–1914. New York, NY: Oxford University Press. ISBN 978-0-19-506271-7. ^ "What Makes A Successful Global Financial Centre?". Gresham College. 14 October 2009. Retrieved 24 May 2015. ^ Mercer (3 August 2012). "Cost of living and quality of life in international financial centres". City of London. Retrieved 23 May 2015. ^ "New York and London vie for crown of world's top financial centre". The Financial Times. 1 October 2014. Retrieved 24 May 2015. ^ Beth Gardiner (20 January 2010). "The London Banking Center Is Beginning to Feel Like Itself Again". The New York Times: Global Business. Retrieved 15 January 2011. ^ Bourse Consult (18 November 2013). "From local to global: building a modern financial centre". City of London. Retrieved 24 May 2015. ^ a b c d e Wójcik, Dariusz (2011). "The dark side of NY–LON: Financial centres and the global financial crisis". School of Geography and Environment, University of Oxford. SSRN 1890644. ^ Patrick McGeehan (22 February 2009). "After Reversal of Fortunes, City Takes a New Look at Wall Street". The New York Times. Retrieved 15 January 2011. ^ a b c Daniel Altman (30 September 2008). "Other financial centers could rise amid crisis". The New York Times. Retrieved 15 January 2011. ^ "2013 WFE Market Highlights" (PDF). World Federation of Exchanges. Archived from the original (PDF) on 27 March 2014. Retrieved 20 July 2014. ^ a b c d e f McKinsey & Company and the New York City Economic Development Corporation (2007). "Sustaining New York's and the US' Global Financial Services Leadership" (PDF). City of New York. Retrieved 2 May 2015. ^ "Backgrounder: The Shifting Capital of Capital". The New York Times. 12 July 2007. Retrieved 25 May 2015. ^ a b Huw Jones (4 September 2018). "United States top, Britain second in financial activity: think-tank". Thomson Reuters. Retrieved 5 September 2018. Think-tank New Financial’s study, which focuses on the “raw” value of actual domestic and international financial activity like managing assets and issuing equity, underscored the overall dominance of New York as the world’s top financial center. ^ "Total debt securities" (PDF). Bank for International Settlements. June 2013. Retrieved 23 May 2015. ^ a b c d "Top 10 Stock Exchanges in the world". World Stock Exchanges. 2011. Retrieved 24 May 2015 ; "UK's financial services trade surplus biggest in the world, dwarfing its nearest rivals". TheCityUK. 3 July 2014. Retrieved 5 June 2015. ^ a b Matt Taibbi (13 July 2009). "The Great American Bubble Machine". Rolling Stone. p. 6. Archived from the original on 6 April 2010. Retrieved 27 August 2015. ^ "About the Fed." New York Federal Reserve Web page. Footnote upgraded/confirmed 30 March 2010. ^ Binnyamin Appelbaum (25 August 2015). "Bets That the Fed Will Delay Interest Rate Rise Could Be Premature". The New York Times. Retrieved 27 August 2015. In addition, the International Monetary Fund has expressed concern that the Fed, by raising rates, could increase pressure on developing economies. ^ Michie, Ranald (2006). The Global Securities Market: A History. OUP Oxford. ISBN 0191608599. ^ "UK leading the way as an international centre for legal services and dispute resolution". TheCityUK. 30 January 2014. Retrieved 5 June 2015. English law remains one of our most significant exports and continues to ensure the UK plays a leading role in global commerce ; "English Common Law is the most widespread legal system in the world" (PDF). Sweet & Maxwell. November 2008. Retrieved 16 December 2013. ^ Clark, David (2003). Urban world/global city. Routledge. pp. 174–176. ISBN 0415320976 ; Shubik, Martin (1999). The theory of money and financial institutions. MIT Press. p. 8. ISBN 0262693119 ; Europe Economics (6 July 2011). "The value of Europe's international financial centres to the EU economy". City of London and TheCityUK. p. 6. Archived from the original on 25 May 2015. Retrieved 23 May 2015. ^ a b c d Michie, Ranald (July 2012). "The City of London as a Global Financial Centre: An historical and comparative perspective". Archived from the original on 7 July 2015. ^ "UK's financial services trade surplus biggest in the world, dwarfing its nearest rivals". TheCityUK. 3 July 2014. Retrieved 5 June 2015 ; Oxford Economics (20 January 2011). "London's competitive place in the UK and global economies". City of London. Archived from the original on 27 April 2015. Retrieved 24 May 2015. ^ "London's Low Taxes Lure Foreign Companies as Banks Retrench". Bloomberg L.P. Retrieved 22 December 2013 ; "KPMG's Annual Tax Competitiveness Survey 2013". KPMG. Retrieved 22 December 2013. ^ "London Is Eating New York's Lunch". The New York Times Magazine. 29 February 2012. Retrieved 24 May 2015. ^ "Triennial Central Bank Survey: OTC interest rate derivatives turnover in April 2013" (PDF). Bank for International Settlements. September 2013. p. 11. Retrieved 20 May 2015. ^ "Triennial Central Bank Survey: Foreign exchange turnover in April 2013" (PDF). Bank for International Settlements. September 2013. p. 14. Retrieved 23 May 2015. ^ "International money market instruments - all issuers By residence of issuer" (PDF). Bank for International Settlements. March 2015. Retrieved 23 May 2015. ^ "International debt securities - all issuers All maturities, by residence of issuer" (PDF). Bank for International Settlements. March 2015. Retrieved 23 May 2015. ^ "LBMA says banks back its plan to change London gold market". Financial Times. 18 August 2016. Retrieved 9 October 2016 ; "A guide to The London Bullion Market Association" (PDF). London Bullion Market Association. May 2015. Retrieved 9 October 2016 ; "London Metal Exchange". The London Metal Exchange. Retrieved 9 October 2016. ^ "External loans and deposits of banks" (PDF). Bank for International Settlements. April 2015. Retrieved 23 May 2015. ^ "London Wants to Tap Chinese Currency Market". The New York Times Deal Book. 16 January 2012. Retrieved 13 December 2014. ^ a b c d "Brexit: the United Kingdom and EU financial services" (PDF). Economic Governance Support Unit of the European Parliament. 9 December 2016. Retrieved 2 March 2018. 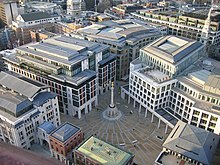 ^ "EBA seeks more time in London after Brexit". Financial News. 8 January 2018. Retrieved 5 April 2018. ^ a b Martin Fackler (16 November 2007). "Tokyo Seeking a Top Niche in Global Finance". The New York Times: World Business. Retrieved 15 January 2011. ^ Sassen, Saskia (2001). The Global City: New York, London, Tokyo (2nd ed.). Princeton University Press. ^ "Japan-U.S. Symposium". Harvard Law School, Program on International Financial Systems, Japan-U.S. Symposium. Retrieved 30 May 2015. ^ "The financial and business sector in the Amsterdam metropolitan area" (PDF). Amsterdam Business. Archived from the original (PDF) on 5 July 2015. Retrieved 23 May 2015. ^ "Netherlands and UK are biggest channels for corporate tax avoidance". The Guardian. 25 July 2017. ^ "The Netherlands is world's biggest conduit to offshore tax havens: research". Dutch News NL. 24 July 2017. ^ "Ireland is top Eurozone jurisdiction for SPVs". Irish Independent. 19 August 2017. ^ "Ireland's IFSC (International Financial Services Centre)". Finance Dublin. Retrieved 23 May 2015. ^ "Key Facts". IFSC Ireland. Retrieved 23 May 2015. ^ (Xinhua) (2 June 2009). "HK, Shenzhen promote financial industry in NY". China Daily. Retrieved 15 January 2011. ^ "Hong Kong's Likely Return as Top IPO Market Not All Rosy". Wall Street Journal. 23 June 2016. Retrieved 9 October 2016. ^ "China to Wall Street's Deal Makers: We Don't Need You". Wall Street Journal. 21 February 2016. Retrieved 9 October 2016. ^ "Number of banks per country of origin". Commission de Surveillance du Secteur Financier. 30 April 2015. Retrieved 25 May 2015. ^ "Luxembourg third largest RMB centre worldwide". Investment Europe. 9 July 2014. Retrieved 25 May 2015. ^ a b "Singapore may renegotiate EU trade deal after Brexit removes British markets". Independent. 21 August 2017. Retrieved 21 August 2017. ^ "Singapore jostles with Hong Kong for financial crown". The Financial Times. 16 October 2014. Retrieved 25 May 2015. ^ "Brand Singapore Takes a Beating". Wall Street Journal. 25 July 2016. Retrieved 9 October 2016. ^ "Portrait of the Zurich financial centre". Finanzplatz Zurich. Archived from the original on 8 May 2015. Retrieved 24 May 2015. ^ "The Zurich banking centre" (PDF). Zurich Banking Association. Archived from the original (PDF) on 25 May 2015. Retrieved 24 May 2015. ^ "Financial Services". Canton of Zurich. Retrieved 24 May 2015. ^ Heather Timmons (27 October 2006). "New York Isn't the World's Undisputed Financial Capital". The New York Times. Retrieved 15 January 2011. ^ "Dubai as an international financial centre" (PDF). Cass Business School. September 2013. Retrieved 2 June 2015. ^ a b "History of the Frankfurt Stock Exchange – Patricians, princes and commodity markets: 18th - 19th century". Deutsche Börse. Retrieved 11 July 2015. ^ "Frankfurt as a Financial Centre". The Financial Times. Retrieved 25 May 2015. ^ "Contacts". EIOPA: European Insurance and Occupational Pensions Authority. ^ Jeske, Carl-Ludwig Holtfrerich. ; Metzler, Friedrich von (1999). Frankfurt as a financial centre : from medieval trade fair to European banking centre. München: Beck. ISBN 9783406456718. ^ Europe Economics (July 2011). "Value of EU's Financial Centres" (PDF). City of London Corporation and TheCityUK. Archived from the original (PDF) on 18 August 2016. Retrieved 11 July 2016. ^ Europe Economics (6 July 2011). "The value of Europe's international financial centres to the EU economy". City of London and TheCityUK. Archived from the original on 25 May 2015. Retrieved 23 May 2015. ^ Sako, Musterd; Murie, Alan, eds. (2011). Making Competitive Cities. John Wiley & Sons. ISBN 1444390422. ^ "Paris, the Euro Area's leading financial centre". French Ministry of Foreign Affairs and International Development. Retrieved 24 May 2015. ^ "Relocation of the UK-based EU agencies - Consilium". www.consilium.europa.eu. Retrieved 16 April 2018. ^ "Seoul's Rise as a Global Financial Center". The Korea Society. 21 September 2012. Retrieved 25 May 2015. ^ Seth Faison (13 December 1996). "Hong Kong Continues to Eclipse An Economic Rebirth in Shanghai". The New York Times: Business Day. Retrieved 15 January 2011. ^ Hong Liang (4 May 2009). "Software for a financial center here". China Daily. Retrieved 15 January 2011. ^ Dealbook (2 March 2010). "Shanghai Opens Doors to Financial World". The New York Times. Retrieved 15 January 2011. ^ Daniel Gross (14 October 2007). "The Capital of Capital No More?". The New York Times: Magazine. Retrieved 15 January 2011. ^ "Sydney seeks to become Asia finance hub with Barangaroo project". Financial Times. 22 March 2015. ^ "Rethinking Sydney's role as an international financial centre". China Spectator. 25 November 2014. Retrieved 25 May 2015. 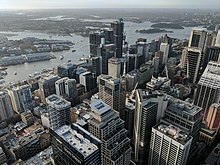 ^ "Sydney losing battle to become a leading financial centre". Sydney Morning Herald. 25 September 2014. Retrieved 25 May 2015. ^ "Financial Services". Invest Toronto. Retrieved 25 May 2015. ^ "Mumbai – An International Financial Centre". Indian Institute of Management Bangalore. March 2008. Retrieved 24 May 2015. ^ "Making Mumbai an International Financial Centre" (PDF). Ministry of Finance, Government of India. 2007. Retrieved 24 May 2015. ^ "Mumbai's dream of becoming an international financial centre may soon be a reality". The Economic Times. 3 November 2014. Retrieved 24 May 2015. ^ a b Coispeau, Olivier (10 August 2016). Finance Masters: A Brief History of International Financial Centers in the Last Millennium. World Scientific. ISBN 9789813108844. ^ Lucas, Sam (23 October 2013). "The Dutch Financial Golden Age". CorporateLiveWire.com. Retrieved 23 January 2017. ^ Lucas, Sam (1 November 2013). "European Business Travel: Central Europe". CorporateLiveWire.com. Retrieved 1 February 2017. ^ Gelderblom, Oscar; Jonker, Joost (2004). "Completing a Financial Revolution: The Finance of the Dutch East India Trade and the Rise of the Amsterdam Capital Market, 1595–1612". The Journal of Economic History. 64 (03): 641–72. ^ Taylor, Bryan (8 December 2013). "How 3 Countries Lost Their Position As The World's Dominant Financial Power Over The Last 800 Years". Global Financial Data. Retrieved 14 May 2014. ^ Wilson, Eric Michael: The Savage Republic: De Indis of Hugo Grotius, Republicanism and Dutch Hegemony within the Early Modern World-System (c.1600–1619). (Martinus Nijhoff, 2008, ISBN 978-9004167889), p. 215–217. Eric Michael Wilson (2008): "The defining characteristics of the modern corporation, all of which emerged during the Dutch cycle, include: limited liability for investors, free transferability of investor interests, legal personality and centralised management. Although some of these characteristics were present to a certain extent in the fourteenth-century Genoese societas comperarum of the first cycle, the first wholly cognisable modern limited liability public company was the VOC." ^ Sayle, Murray (5 April 2001). "Japan goes Dutch". London Review of Books. The Netherlands United East Indies Company (Verenigde Oostindische Compagnie, or VOC), founded in 1602, was the world's first multinational, joint-stock, limited liability corporation – as well as its first government-backed trading cartel. ^ Phelan, Ben (7 January 2013). "Dutch East India Company: The World's First Multinational". PBS.org. Retrieved 18 March 2018. ^ Taylor, Bryan (6 November 2013). "The Rise and Fall of the Largest Corporation in History". BusinessInsider.com. Retrieved 18 March 2018. ^ "Amsterdam: Where It All Began". IFA.com (Index Fund Advisors, Inc.). 12 August 2012. Retrieved 21 January 2017. ^ Stringham, Edward Peter; Curott, Nicholas A.: On the Origins of Stock Markets [Part IV: Institutions and Organizations; Chapter 14], pp. 324-344, in The Oxford Handbook of Austrian Economics, edited by Peter J. Boettke and Christopher J. Coyne. (Oxford University Press, 2015, ISBN 978-0199811762). Edward P. Stringham & Nicholas A. Curott: "Business ventures with multiple shareholders became popular with commenda contracts in medieval Italy (Greif, 2006, p. 286), and Malmendier (2009) provides evidence that shareholder companies date back to ancient Rome. Yet the title of the world's first stock market deservedly goes to that of seventeenth-century Amsterdam, where an active secondary market in company shares emerged. The two major companies were the Dutch East India Company and the Dutch West India Company, founded in 1602 and 1621. Other companies existed, but they were not as large and constituted a small portion of the stock market (Israel  1991, 109–112; Dehing and 't Hart 1997, 54; dela Vega  1996, 173)." ^ Murphy, Richard McGill (1 July 2014). "Is Asia the next financial center of the world?". CNBC.com. Retrieved 13 March 2018. ^ Gordon, John Steele: The Great Game: The Emergence of Wall Street as a World Power, 1653–2000. (Scribner Book Company, 1999, ISBN 978-0684832876). As John Steele Gordon (1999) noted, "Although many of the basic concepts had first appeared in Italy during the Renaissance, the Dutch, especially the citizens of the city of Amsterdam, were the real innovators. They transformed banking, stock exchanges, credit, insurance, and limited-liability corporations into a coherent financial and commercial system." ^ Goetzmann, William N.; Rouwenhorst, K. Geert (2008). The History of Financial Innovation, in Carbon Finance, Environmental Market Solutions to Climate Change. (Yale School of Forestry and Environmental Studies, chapter 1, pp. 18–43). As Goetzmann & Rouwenhorst (2008) noted, "The 17th and 18th centuries in the Netherlands were a remarkable time for finance. Many of the financial products or instruments that we see today emerged during a relatively short period. In particular, merchants and bankers developed what we would today call securitization. Mutual funds and various other forms of structured finance that still exist today emerged in the 17th and 18th centuries in Holland." ^ "The Keynes Conundrum by David P. Goldman". First Things (firstthings.com). 1 October 2010. Retrieved 11 November 2017. Reuven Brenner & David P. Goldman (2010) noted, "Western societies developed the institutions that support entrepreneurship only through a long and fitful process of trial and error. Stock and commodity exchanges, investment banks, mutual funds, deposit banking, securitization, and other markets have their roots in the Dutch innovations of the seventeenth century but reached maturity, in many cases, only during the past quarter of a century." ^ Mead, Walter Russell (18 April 2009). "Walter Russell Mead On Why Lula Was Right (The Debt We Owe the Dutch: Blue-Eyed Bankers Have Given Us More Than the Current Financial Crisis)". Newsweek Magazine (newsweek.com). Retrieved 13 March 2018. Walter Russell Mead: "The modern financial system grows out of a series of innovations in 17th-century Netherlands, and the Dutch were, on the whole, as Lula describes them. From the Netherlands, what the English called "Dutch finance" traveled over the English Channel, as the English borrowed Dutch ideas to build a stock market, promote global trade and establish the Bank of England..."
International Financial Centres – news articles from The Banker magazine. Financial Centres International – a forum on developments in international financial services centres. Financial Centre Futures – research on global financial centres from the Z/Yen Group.